"Godard" redirects here. For other uses, see Godard (disambiguation). Jean-Luc Godard (French: [ʒɑ̃lyk ɡɔdaʁ]; born 3 December 1930) is a French-Swiss film director, screenwriter and film critic. He rose to prominence as a pioneer of the 1960s French New Wave film movement. Like his New Wave contemporaries, Godard criticized mainstream French cinema's "Tradition of Quality", which "emphasized craft over innovation, privileged established directors over new directors, and preferred the great works of the past to experimentation." As a result of such argument, he and like-minded critics started to make their own films. Many of Godard's films challenge the conventions of traditional Hollywood in addition to French cinema. In 1964, Godard described his and his colleagues' impact: "We barged into the cinema like cavemen into the Versailles of Louis XV." He is often considered the most radical French filmmaker of the 1960s and 1970s; his approach in film conventions, politics and philosophies made him arguably the most influential director of the French New Wave. Along with showing knowledge of film history through homages and references, several of his films expressed his political views; he was an avid reader of existential and Marxist philosophy. Since the New Wave, his politics have been much less radical and his recent films are about representation and human conflict from a humanist, and a Marxist perspective. In a 2002 Sight & Sound poll, Godard ranked third in the critics' top-ten directors of all time (which was put together by assembling the directors of the individual films for which the critics voted). He is said to have "created one of the largest bodies of critical analysis of any filmmaker since the mid-twentieth century." He and his work have been central to narrative theory and have "challenged both commercial narrative cinema norms and film criticism's vocabulary." In 2010, Godard was awarded an Academy Honorary Award, but did not attend the award ceremony. Godard's films have inspired many directors including Martin Scorsese, Quentin Tarantino, Brian De Palma, Steven Soderbergh, D. A. Pennebaker, Robert Altman, Jim Jarmusch, Wong Kar-wai, Wim Wenders, Bernardo Bertolucci, and Pier Paolo Pasolini. From his father, he is the cousin of Pedro Pablo Kuczynski, former President of Peru. He has been married twice, to actresses Anna Karina and Anne Wiazemsky, both of whom starred in several of his films. His collaborations with Karina—which included such critically acclaimed films as Bande à part (1964) and Pierrot le Fou (1965)—was called "arguably the most influential body of work in the history of cinema" by Filmmaker magazine. Jean-Luc Godard was born on 3 December 1930 in the 7th arrondissement of Paris, the son of Odile (née Monod) and Paul Godard, a Swiss physician. His wealthy parents came from Protestant families of Franco–Swiss descent, and his mother was the daughter of Julien Monod, a founder of the Banque Paribas. She was the great-granddaughter of theologian Adolphe Monod. Relatives on his mother's side include also composer Jacques-Louis Monod, naturalist Théodore Monod and pastor Frédéric Monod. Four years after Jean-Luc's birth, his father moved the family to Switzerland. At the outbreak of the Second World War, Godard was in France and returned to Switzerland with difficulty. He spent most of the war in Switzerland, although his family made clandestine trips to his grandfather's estate on the French side of Lake Geneva. Godard attended school in Nyon, Switzerland. Not a frequent cinema-goer, he attributed his introduction to cinema to a reading of Malraux's essay Outline of a Psychology of Cinema, and his reading of La Revue du cinéma, which was relaunched in 1946. In 1946, he went to study at the Lycée Buffon in Paris and, through family connections, mixed with members of its cultural elite. He lodged with the writer Jean Schlumberger. Having failed his baccalaureate exam in 1948 he returned to Switzerland. He studied in Lausanne and lived with his parents, whose marriage was breaking up. He spent time in Geneva also with a group that included another film fanatic, Roland Tolmatchoff, and the extreme rightist philosopher Jean Parvulesco. His older sister Rachel encouraged him to paint, which he did, in an abstract style. After time spent at a boarding school in Thonon to prepare for the retest, which he passed, he returned to Paris in 1949. He registered for a certificate in anthropology at the University of Paris (Sorbonne), but did not attend class. He got involved with the young group of film critics at the ciné-clubs that started the New Wave. Godard originally held only French citizenship, then in 1953, he became a citizen of Gland, canton of Vaud, Switzerland, possibly through simplified naturalisation through his Swiss father. In Paris, in the Latin Quarter just prior to 1950, ciné-clubs (film societies) were gaining prominence. Godard began attending these clubs – the Cinémathèque, the CCQL, Work and Culture ciné Club, and others – which became his regular haunts. The Cinémathèque had been founded by Henri Langlois and Georges Franju in 1936; Work and Culture was a workers' education group for which André Bazin had organized wartime film screenings and discussions and which had become a model for the film clubs that had risen throughout France after the Liberation; Ciné-Club du Quartier Latin (CCQL), founded 1947-48, was animated and intellectually led by Maurice Schérer. At these clubs he met fellow film enthusiasts including Jacques Rivette, Claude Chabrol, and François Truffaut. Godard was part of a generation for whom cinema took on a special importance. He has said: "In the 1950s cinema was as important as bread—but it isn't the case any more. We thought cinema would assert itself as an instrument of knowledge, a microscope... a telescope.... At the Cinémathèque I discovered a world which nobody had spoken to me about. They'd told us about Goethe, but not Dreyer. ... We watched silent films in the era of talkies. We dreamed about film. We were like Christians in the catacombs." His foray into films began in the field of criticism. Along with Maurice Schérer (writing under the to-be-famous pseudonym Éric Rohmer) and Rivette, he founded the short-lived film journal Gazette du cinéma, which saw publication of five issues in 1950. When Bazin co-founded the influential critical magazine Cahiers du cinéma in 1951, Godard was the first of the younger critics from the CCQL/Cinémathèque group to be published—the January 1952 issue featured his review of an American melodrama directed by Rudolph Maté, No Sad Songs for Me. His "Defence and Illustration of Classical Découpage" published in September 1952, in which he attacks an earlier article by Bazin and defends the use of the shot-reverse shot technique, is one of his earliest important contributions to cinema. Praising Otto Preminger and "the greatest American artist—Howard Hawks", Godard raises their harsh melodramas above the more "formalistic and overtly artful films of Welles, De Sica and Wyler which Bazin endorsed". At this point Godard's activities did not include making films—rather he watched films, and wrote about them, and helped others make films, notably Rohmer, with whom he worked on Présentation ou Charlotte et son steak. Having left Paris in the autumn of 1952, Godard returned to Switzerland and went to live with his mother in Lausanne. He became friendly with his mother's lover, Jean-Pierre Laubscher, who was a labourer on the Grande Dixence Dam. Through Laubscher he secured work himself as a construction worker at the Plaz Fleuri work site at the dam. He saw the possibility of making a documentary film about the dam and when his initial contract ended, in order to prolong his time at the dam, moved to the post of telephone switchboard operator. It was whilst on duty, in April 1954, that he put through a call to Laubscher that relayed the fact that Odile Monod, his mother, had died in a scooter accident. Thanks to Swiss friends who lent him a 35mm movie camera, he was able to shoot on 35mm film. He rewrote the commentary that Laubscher had written, and gave his film a rhyming title Opération béton (Operation concrete). The company that administered the dam bought the film and used it for publicity purposes. As he continued to work for Cahiers, he made Une femme coquette (1955), a 10-minute short, in Geneva; and in January 1956 he returned to Paris. A plan for a feature film of Goethe's Elective Affinities proved too ambitious and came to nothing. Truffaut enlisted his help to work on an idea he had for a film based on the true-crime story of a petty criminal, Michel Portail, who had shot a motorcycle policeman and whose girlfriend had turned him in to the police, but Truffaut failed to interest any producers. Another project with Truffaut, a comedy about a country girl arriving in Paris, was also abandoned. He worked with Rohmer on a planned series of short films centering on the lives of two young women, Charlotte and Véronique; and in the autumn of 1957, Pierre Braunberger produced the first film in the series, All the Boys Are Named Patrick, directed by Godard from Rohmer's script. Une histoire d'eau (1958) was created largely out of unused footage shot by Truffaut. In 1958, Godard, with a cast that included Jean-Paul Belmondo and Anne Colette, made his last short before gaining international prominence as a filmmaker, Charlotte et son Jules, an homage to Jean Cocteau. The film was shot in Godard's hotel room on the rue de Rennes and apparently reflected something of the 'romantic austerity' of Godard's own life at this time. His Swiss friend Roland Tolmatchoff noted; "In Paris he had a big Bogart poster on the wall and nothing else." In December 1958, Godard reported from the Festival of Short Films in Tours and praised the work of, and became friends with, Jacques Demy, Jacques Rozier, and Agnès Varda—he already knew Alain Resnais whose entry he also praised—but Godard now wanted to make a feature film. He travelled to the 1959 Cannes Film Festival and asked Truffaut to let him use the story on which they had collaborated in 1956, about the car thief Michel Portail. He sought money from the producer Georges de Beauregard whom he had met previously whilst working briefly in the publicity department of Twentieth Century Fox's Paris office, and who was also at the Festival. Beauregard could offer his expertise, but was in debt from two productions based on Pierre Loti stories and so financing came instead from a film distributor, René Pignières. Godard's most celebrated period as a director spans roughly from his first feature, Breathless (1960), through to Week End (1967). His work during this period focused on relatively conventional films that often refer to different aspects of film history. Although Godard's work during this time is considered groundbreaking in its own right, the period stands in contrast to that which immediately followed it, during which Godard ideologically denounced much of cinema's history as "bourgeois" and therefore without merit. Godard's Breathless (À bout de souffle, 1960), starring Jean-Paul Belmondo and Jean Seberg distinctly expressed the French New Wave's style, and incorporated quotations from several elements of popular culture—specifically American film noir. The film employed various techniques such as the innovative use of jump cuts (which were traditionally considered amateurish), character asides, and breaking the eyeline match in continuity editing. From the beginning of his career, Godard included more film references into his movies than did any of his New Wave colleagues. In Breathless, his citations include a movie poster showing Humphrey Bogart—from The Harder They Fall, his last film (whose expression the lead actor Jean-Paul Belmondo tries reverently to imitate)—visual quotations from films of Ingmar Bergman, Samuel Fuller, Fritz Lang, and others; and an onscreen dedication to Monogram Pictures, an American B-movie studio. Quotations from, and references to literature include William Faulkner, Dylan Thomas, Louis Aragon, Rilke, Françoise Sagan, Maurice Sachs. The film also contains citations in images or on the soundtrack—Mozart, Picasso, J. S. Bach, Paul Klee, and Auguste Renoir. "This first-person cinema invoked not the director's experience but his presence". Godard wanted to hire the American actress Jean Seberg, who was living in Paris with her husband François Moreuil, an attorney, to play the American woman. Seberg had become famous in 1956 when Otto Preminger had chosen her to play Joan of Arc in his Saint Joan, and had then cast her in his acidulous 1958 adaptation of Bonjour Tristesse. Her performance in this film had not been generally regarded as a success—the New York Times critic called her a "misplaced amateur"—but Truffaut and Godard disagreed. In the role of Michel Poiccard, Godard cast Belmondo, an actor he had already called, writing in Arts in 1958, "the Michel Simon and the Jules Berry of tomorrow." The cameraman was Raoul Coutard, the producer Beauregard's choice. Godard wanted Breathless to be shot like a documentary, with a lightweight handheld camera and a minimum of added lighting and Coutard had had experience as a documentary cameraman while working for the French army's information service in Indochina during the French-Indochina War. Tracking shots were filmed by Coutard from a wheelchair pushed by Godard. Though he had prepared a traditional screenplay, he dispensed with it and Godard wrote the dialogue day by day as the production went ahead. The film's importance was recognized immediately and in January 1960, Godard won the Jean Vigo Prize, awarded " to encourage an auteur of the future". One reviewer mentioned Alexandre Astruc's prophecy of the age of the caméra-stylo, the camera that a new generation would use with the efficacy with which a writer uses his pen—"here is in fact the first work authentically written with a caméra-stylo". The following year Godard made Le Petit Soldat (The Little Soldier), filmed on location in Geneva, and dealing with the Algerian War of Independence. The film begins on 13 May 1958, the date of the attempted putsch in Algeria, and ends later the same month. In the film, Bruno Forestier a photojournalist who has links with a right wing paramilitary group working for the French government, is ordered to murder a professor accused of aiding the Algerian resistance. He is in love with Veronica Dreyer, a young woman who has worked with the Algerian fighters. He is captured by Algerian militants and tortured. His organisation captures and tortures her. The 'little soldier' was played by Michel Subor and Veronica Dreyer by Anna Karina—his first collaboration with her. Unlike Seberg, Karina had virtually no experience as an actress and Godard used her awkwardness as an element of her performance. He wrote the dialogue every day and, since it was filmed without direct sound and was dubbed, called dialogue to the actors. Forestier was a character close to Godard himself, an image-maker and intellectual, 'more or less my spokesman, but not totally' Godard told an interviewer. The film, due to its political nature, implied that France was involved in a dirty war, engaging in torture, and was banned by the French government until January 1963. Godard and Karina were a couple by the end of the shoot. She appeared again, along with Belmondo, in Godard's first color film, A Woman Is a Woman (1961), which was intended as a homage to the American musical. Adjustments that Godard made to the original version of the story gave it autobiographical resonances, 'specifically in regard to his relationship with Anna Karina'. The film revealed 'the confinement within the four walls of domestic life', and 'the emotional and artistic fault lines that threatened their relationship'. Godard's next film, Vivre sa vie (My Life to Live) (1962), was one of his most popular among critics. Karina starred as Nana, an errant mother and aspiring actress whose financially strained circumstances lead her to the life of a streetwalker. It is an episodic account of her rationalizations to prove she is free, even though she is tethered at the end of her pimp's short leash. In one scene, within a cafe, she spreads her arms out and announces she is free to raise or lower them as she wishes. The film was a popular success and led to Columbia giving him a deal where he would be provided with $100,000 to make a movie, with complete artistic control. Les Carabiniers (1963) was about the horror of war and its inherent injustice. It was the influence and suggestion of Roberto Rossellini that led Godard to make this film which follows two peasants who join the army of a king, only to find futility in the whole thing as the king reveals the deception of war-administrating leaders. His most commercially successful film was Le Mépris (Contempt) (1963), starring Michel Piccoli and one of France's biggest female stars, Brigitte Bardot. A coproduction between Italy and France, Contempt became known as a pinnacle in cinematic modernism with its profound reflexivity. The film follows Paul (Piccoli), a screenwriter who is commissioned by the arrogant American movie producer Prokosch (Jack Palance) to rewrite the script for an adaptation of Homer's Odyssey, which the Austrian director Fritz Lang has been filming. Lang's 'high culture' interpretation of the story is lost on Prokosch, whose character is a firm indictment of the commercial motion picture hierarchy. Another prominent theme is the inability to reconcile love and labor, which is illustrated by Paul's crumbling marriage to Camille (Bardot) during the course of shooting. In 1964, Godard and Karina formed a production company, Anouchka Films. He directed Bande à part (Band of Outsiders), another collaboration between the two and described by Godard as "Alice in Wonderland meets Franz Kafka." It follows two young men, looking to score on a heist, who both fall in love with Karina, and quotes from several gangster film conventions. Une femme mariée (A Married Woman) (1964) followed Band of Outsiders. It was a slow, deliberate, toned-down black-and-white picture without a real story. The film was shot in four weeks and was "an explicitly and stringently modernist film". It showed Godard's "engagement with the most advanced thinking of the day, as expressed in the work of Claude Lévi-Strauss and Roland Barthes" and its fragmentation and abstraction reflected also "his loss of faith in the familiar Hollywood styles." Godard made the film while he acquired funding for Pierrot le Fou (1965). In 1965, Godard directed Alphaville, a futuristic blend of science fiction, film noir, and satire. Eddie Constantine starred as Lemmy Caution, a detective who is sent into a city controlled by a giant computer named Alpha 60. His mission is to make contact with Professor von Braun (Howard Vernon), a famous scientist who has fallen mysteriously silent, and is believed to be suppressed by the computer. Pierrot le Fou (1965) featured a complex storyline, distinctive personalities, and a violent ending. Gilles Jacob, an author, critic, and president of the Cannes Film Festival, called it both a "retrospective" and recapitulation in the way it played on so many of Godard's earlier characters and themes. With an extensive cast and variety of locations, the film was expensive enough to warrant significant problems with funding. Shot in color, it departed from Godard's minimalist works (typified by Breathless, Vivre sa vie, and Une femme mariée). He solicited the participation of Jean-Paul Belmondo, by then a famous actor, in order to guarantee the necessary amount of capital. Masculin Féminin (1966), based on two Guy de Maupassant stories, La Femme de Paul and Le Signe, was a study of contemporary French youth and their involvement with cultural politics. An intertitle refers to the characters as "The children of Marx and Coca-Cola." Although Godard's cinema is sometimes thought to depict a wholly masculine point of view, Phillip John Usher has demonstrated how the film, by the way it connects images and disparate events, seems to blur gender lines. Godard followed with Made in U.S.A (1966), whose source material was Richard Stark's The Jugger; and Two or Three Things I Know About Her (1967), in which Marina Vlady portrays a woman leading a double life as housewife and prostitute. A Classic New Wave crime thriller, "Made in the U.S.A" is inspired by American Noir films. Anna Karina stars as the anti-hero searching for her murdered lover; the film includes a cameo by Marianne Faithfull. La Chinoise (1967) saw Godard at his most politically forthright so far. The film focused on a group of students and engaged with the ideas coming out of the student activist groups in contemporary France. Released just before the May 1968 events, the film is thought by some to foreshadow the student rebellions that took place. That same year, Godard made a more colorful and political film, Week-end. It follows a Parisian couple as they leave on a weekend trip across the French countryside to collect an inheritance. What ensues is a confrontation with the tragic flaws of the over-consuming bourgeoisie. The film contains some of the most written-about scenes in cinema's history. One of them, an eight-minute tracking shot of the couple stuck in an unremitting traffic jam as they leave the city, is cited as a new technique Godard used to deconstruct bourgeois trends. Startlingly, a few shots contain extra footage from, as it were, before the beginning of the take (while the actors are preparing) and after the end of the take (while the actors are coming out of character). Week End's enigmatic and audacious end title sequence, which reads "End of Cinema", appropriately marked an end to the narrative and cinematic period in Godard's filmmaking career. Politics are never far from the surface in Godard's films. One of his earliest features, Le Petit Soldat, which dealt with the Algerian War of Independence, was notable for its attempt to present the complexity of the dispute rather than pursue any specific ideological agenda. Along these lines, Les Carabiniers presents a fictional war that is initially romanticized in the way its characters approach their service, but becomes a stiff anti-war metonym. In addition to the international conflicts Godard sought an artistic response to, he was also very concerned with the social problems in France. The earliest and best example of this is Karina's potent portrayal of a prostitute in Vivre sa vie. In 1960s Paris, the political milieu was not overwhelmed by one specific movement. There was, however, a distinct post-war climate shaped by various international conflicts such as the colonialism in North Africa and Southeast Asia. Godard's Marxist disposition did not become abundantly explicit until La Chinoise and Week End, but is evident in several films—namely Pierrot and Une femme mariée. Godard has been accused by some of harboring anti-Semitic views: in 2010, in the lead-up to the presentation of Godard's honorary Oscar, a prominent article in the New York Times by Michael Cieply drew attention to the idea, which had been circulating through press in previous weeks, that Godard might be an anti-Semite, and thus undeserving of the accolade. Cieply makes reference to Richard Brody's book, Everything is Cinema: The Working Life of Jean-Luc Godard, and alluded to a previous, longer article published by the Jewish Journal as lying near the origin of the debate. The article also draws upon Brody's book, for example in the following quotation, which Godard made on television in 1981: "Moses is my principal enemy...Moses, when he received the commandments, he saw images and translated them. Then he brought the texts, he didn't show what he had seen. That's why the Jewish people are accursed." Immediately after Cieply's article was published, Brody made a clear point of criticizing the "extremely selective and narrow use" of passages in his book, and noted that Godard's work has approached the Holocaust with "the greatest moral seriousness". Indeed, his documentaries feature images from the Holocaust in a context suggesting he considers Nazism and the Holocaust as the nadir of human history. Godard's views become more complex regarding the State of Israel. In 1970, Godard traveled to the Middle East to make a pro-Palestinian film he didn't complete and whose footage eventually became part of the 1976 film Ici et ailleurs. In this film, Godard seems to view the Palestinian cause as one of many worldwide Leftist revolutionary movements. Elsewhere, Godard has explicitly identified himself as an anti-Zionist but has denied the accusations of anti-Semitism. Godard produced several pieces that directly address the Vietnam War. Furthermore, there are two scenes in Pierrot le fou that tackle the issue. The first is a scene that takes place in the initial car ride between Ferdinand (Belmondo) and Marianne (Karina). Over the car radio, the two hear the message "garrison massacred by the Viet Cong who lost 115 men". Marianne responds with an extended musing on the way the radio dehumanizes the Northern Vietnamese combatants. In the same film, the lovers accost a group of American sailors along the course of their liberating crime spree. Their immediate reaction, expressed by Marianne, is "Damn Americans! ", an obvious outlet of the frustration so many French communists felt towards American hegemony. Ferdinand then reconsiders, "That's OK, we’ll change our politics. We can put on a play. Maybe they’ll give us some dollars." Marianne is puzzled, but Ferdinand suggests that something the Americans would like would be the Vietnam War. The ensuing sequence is a makeshift play where Marianne dresses up as a stereotypical Vietnamese woman and Ferdinand as an American sailor. The scene ends on a brief shot revealing a chalk message left on the floor by the pair, "Long live Mao!" (Vive Mao!). Notably, he also participated in Loin du Vietnam (1967). An anti-war project, it consists of seven sketches directed by Godard (who used stock footage from La Chinoise), Claude Lelouch, Joris Ivens, William Klein, Chris Marker, Alain Resnais and Agnès Varda. Godard's engagement with German poet and playwright Bertolt Brecht stems primarily from his attempt to transpose Brecht's theory of epic theatre and its prospect of alienating the viewer (Verfremdungseffekt) through a radical separation of the elements of the medium (in Brecht's case theater, but in Godard's, film). Brecht's influence is keenly felt through much of Godard's work, particularly before 1980, when Godard used filmic expression for specific political ends. For example, Breathless' elliptical editing, which denies the viewer a fluid narrative typical of mainstream cinema, forces the viewers to take on more critical roles, connecting the pieces themselves and coming away with more investment in the work's content. Godard also employs other devices, including asynchronous sound and alarming title frames, with perhaps his favorite being the character aside. In many of his most political pieces, specifically Week-end, Pierrot le Fou, and La Chinoise, characters address the audience with thoughts, feelings, and instructions. A Marxist reading is possible with most if not all of Godard's early work. Godard's direct interaction with Marxism does not become explicitly apparent, however, until Week End, where the name Karl Marx is cited in conjunction with figures such as Jesus Christ. A constant refrain throughout Godard's cinematic period is that of the bourgeoisie's consumerism, the commodification of daily life and activity, and man's alienation—all central features of Marx's critique of capitalism. In an essay on Godard, philosopher and aesthetics scholar Jacques Rancière states, "When in Pierrot le fou, 1965, a film without a clear political message, Belmondo played on the word 'scandal' and the 'freedom' that the Scandal girdle supposedly offered women, the context of a Marxist critique of commodification, of pop art derision at consumerism, and of a feminist denunciation of women's false 'liberation', was enough to foster a dialectical reading of the joke and the whole story." The way Godard treated politics in his cinematic period was in the context of a joke, a piece of art, or a relationship, presented to be used as tools of reference, romanticizing the Marxist rhetoric, rather than being solely tools of education. Une femme mariée is also structured around Marx's concept of commodity fetishism. Godard once said that it is "a film in which individuals are considered as things, in which chases in a taxi alternate with ethological interviews, in which the spectacle of life is intermingled with its analysis". He was very conscious of the way he wished to portray the human being. His efforts are overtly characteristic of Marx, who in his Economic and Philosophical Manuscripts of 1844 gives one of his most nuanced elaborations, analyzing how the worker is alienated from his product, the object of his productive activity. Georges Sadoul, in his short rumination on the film, describes it as a "sociological study of the alienation of the modern woman". The period that spans from May 1968 indistinctly into the 1970s has been subject to an even larger volume of varying labeling. They include everything from his "militant" period, to his "radical" period, along with terms as specific as "Maoist" and vague as "political". The period saw Godard align himself with a specific revolution and employ a consistent revolutionary rhetoric. Amid the upheavals of the late 1960s, Godard became passionate about "making political films politically." Though many of his films from 1968 to 1972 are feature-length films, they are low budget and challenge the notion of what a film can be. In addition to abandoning mainstream filmmaking, Godard also tried to escape the cult of personality that had formed around him. He worked anonymously in collaboration with other filmmakers, most notably Jean-Pierre Gorin, with whom he formed the Dziga-Vertov cinema collective. During this period, Godard made films in England, Italy, Czechoslovakia, Palestine, and America, as well as France. He and Gorin toured with their work, attempting to create discussion, mainly on college campuses. This period came to a climax with the big budget production Tout Va Bien, which starred Yves Montand and Jane Fonda. Owing to a motorcycle accident that severely incapacitated Godard, Gorin ended up directing this most celebrated of their work together almost single-handedly. As a companion piece to Tout va bien, the pair made Letter to Jane, a 50-minute "examination of a still" showing Jane Fonda visiting with the Viet Cong during the Vietnam War. The film is a deconstruction of Western imperialist ideology. This was the last film that Godard and Gorin made together. In 1978 Godard was commissioned by the Mozambican government to make a short film. During this time his experience with Kodak film led him to criticize the film stock as "inherently racist" since it did not reflect the variety, nuance or complexity in dark brown or dark skin. This was because Kodak Shirley cards were only made for Caucasian subjects, a problem that was not rectified until 1995. Following this important collaboration, Godard met his life partner Anne-Marie Miéville. The two set up a production company, SonImage, in Switzerland and together they made two feature films, Number Two and Comment ca va. They also produced two series for French television, Six fois deux and France/tour/détour/deux enfants. Since Godard returned to mainstream filmmaking in 1980, Anne-Marie Miéville has remained an important collaborator. After the events of May 1968, when the city of Paris saw total upheaval in response to the "authoritarian de Gaulle", and Godard's professional objective was reconsidered, he began to collaborate with like-minded individuals in the filmmaking arena. The most notable collaborator was Jean-Pierre Gorin, a Maoist student of Louis Althusser, Michel Foucault, and Jacques Lacan (who later became professor of Film Studies at the University of California at San Diego), with a passion for cinema that attracted Godard's attention. Between 1968 and 1973, Godard and Gorin collaborated to make a total of five films with strong Maoist messages. The most prominent film from the collaboration was Tout Va Bien(1972). The film starred Jane Fonda, who was, at the time, the wife of French filmmaker Roger Vadim. Fonda was at the height of her acting career, having won an Academy Award for her performance in Klute (1971) and, had gained notoriety as left-wing anti-war activist. The male lead was the legendary French singer and actor Yves Montand, who had appeared in prestgious films by Georges Clouzot, Alain Résnais, Sascha Guitry, Vincent Minelli, George Cukor and Costa-Gavras. The small group of Maoists that Godard had brought together, which included Gorin, adopted the name Dziga Vertov Group. Godard had a specific interest in Vertov, a Soviet filmmaker—whose adopted name is derived from the verb to spin or rotate and is best remembered for Man with the Movie Camera (1929) and a contemporary of both the great Soviet montage theorists, most notably Sergei Eisenstein, and Russian constructivist and avant-garde artists such as Alexander Rodchenko and Vladimir Tatlin. Part of Godard's political shift after May 1968 was toward a proactive participation in the class struggle. In 1972, Godard and Swiss filmmaker Anne-Marie Miéville started the alternative video production and distribution company Sonimage, based in Grenoble. Under Sonimage, Godard produced both Numéro Deux (1975) and "Sauve qui peut (la vie)" (1980). In 1976, Godard and Miéville, his wife, collaborated on a series of innovative video works for European broadcast television called "Six fois deux/Sur et sous la communication" (1976) and "France/tour/détour/deux/enfants" (1978). Godard's return to somewhat more traditional fiction was marked with Sauve qui peut (la vie) (1980), the first of a series of more mainstream films marked by autobiographical currents: for example Passion (1982), Lettre à Freddy Buache (1982), Prénom Carmen (1984), and Grandeur et décadence d'un petit commerce de cinéma (1986). There was, though, another flurry of controversy with Je vous salue, Marie (1985), which was condemned by the Catholic Church for alleged heresy, and also with King Lear (1987), an essay on William Shakespeare and language. Also completed in 1987 was a segment in the film ARIA which was based loosely from the plot of Armide; it is set in a gym and uses several arias by Jean-Baptiste Lully from his famous Armide. His later films have been marked by great formal beauty and frequently a sense of requiem—Nouvelle Vague (New Wave, 1990), the autobiographical JLG/JLG, autoportrait de décembre (JLG/JLG: Self-Portrait in December, 1995), and For Ever Mozart (1996). Allemagne année 90 neuf zéro (Germany Year 90 Nine Zero, 1991) was a quasi-sequel to Alphaville but done with an elegiac tone and focus on the inevitable decay of age. Between 1988 and 1998, he produced what is perhaps the most important work of his career in the multi-part series Histoire(s) du cinéma, a monumental project which combined all the innovations of his video work with a passionate engagement in the issues of twentieth-century history and the history of film itself. In 2001, In Praise of Love (Éloge de l'amour) was released. The film is notable for its use of both film and video—the first half captured in 35-mm black and white, the latter half shot in color on DV—and subsequently transferred to film for editing. The blending of film and video recalls the statement from Sauve Qui Peut, in which the tension between film and video evokes the struggle between Cain and Abel. The film is also noted for containing themes of aging, love, separation, and rediscovery as it follows the young artist Edgar in his contemplation of a new work on the four stages of love. In Notre musique (2004), Godard turned his focus to war, specifically, the war in Sarajevo, but with attention to all war, including the American Civil War, the war between the US and Native Americans, and the Israeli–Palestinian conflict. The film is structured into three Dantean kingdoms: Hell, Purgatory and Paradise. Godard's fascination with paradox is a constant in the film. It opens with a long, ponderous montage of war images that occasionally lapses into the comic; Paradise is shown as a lush wooded beach patrolled by US Marines. Godard's film, Film Socialisme (2010), premiered in the Un Certain Regard section at the 2010 Cannes Film Festival. It was released theatrically in France in May 2010. Godard was rumored to be considering directing a film adaptation of Daniel Mendelsohn's The Lost: A Search for Six of Six Million, an award-winning book about the Holocaust. In 2013, Godard released the short Les trois désastres (The Three Disasters) as part of the omnibus film 3X3D with filmmakers Peter Greenaway and Edgar Pera. 3X3D premiered at the 2013 Cannes Film Festival. His 2014 film Goodbye to Language, shot in 3-D, revolves around a couple who cannot communicate with each other until their pet dog acts as an interpreter for them. The film was selected to compete for the Palme d'Or in the main competition section at the 2014 Cannes Film Festival, where it won the Jury Prize. In 2015 J. Hoberman reported that Godard is working on a new film. Initially titled Tentative de bleu, in December 2016 Wild Bunch co-chief Vincent Maraval stated that Godard had been shooting Le livre d’image (The Image Book) for almost two years "in various Arab countries, including Tunisia" and that it is an examination of the modern Arab World. Godard has been married twice, to two of his leading women: Anna Karina (1961–1965) and Anne Wiazemsky (1967–1979). Beginning in 1970, he collaborated personally and professionally with Anne-Marie Miéville. His relationship with Karina in particular produced some of his most critically acclaimed films, and their relationship was widely publicized; The Independent described them as "one of the most celebrated pairings of the 1960s." A writer for Filmmaker magazine called their collaborations "arguably the most influential body of work in the history of cinema." Karina has said they no longer speak to each other. In 2017, Michel Hazanavicius directed a film about Godard, Redoubtable, based on the memoir, One Year After (2015), by Wiazemsky. It centers on his life in the late 1960s, when he and Wiazemsky made films together. The film premiered at the Cannes Film Festival in 2017. Godard said of the film that it was a "stupid, stupid idea." Godard shares a friendship with Manfred Eicher, founder and head of the innovative German music label ECM Records. The label has released the soundtracks of Nouvelle Vague (ECM NewSeries 1600-01) and Histoire(s) du cinéma (ECM NewSeries 1706) by Godard. This collaboration expanded over the years and led on the one hand into the contribution of several stills from Godard’s movies for album covers. On the other hand, Eicher took over the musical direction of many of Godard’s films like Allemagne 90 neuf zéro, Hélas Pour Moi, JLG or For Ever Mozart. Tracks from ECM records have also been used in his films (for example Ketil Bjørnstad and David Darling's album Epigraphs was extensively used in the soundtrack for In Praise of Love). Additionally Godard has released a collection of short films on the label with Anne-Marie Miéville called Four Short Films (ECM 5001). ^ a b c Grant 2007, Vol. 4, p. 235. ^ "Jean-Luc Godard". New Wave Film. Retrieved 24 May 2013. ^ a b c Grant 2007, Vol. 4, p. 126. ^ David Sterritt. "40 Years Ago, 'Breathless' Was Hyperactive Anarchy. Now It's Part of the Canon". Archived from the original on 2 November 2013. Retrieved 24 May 2013. ^ "BFI – Sight & Sound – Top Ten Poll 2002 Poll – The Critics' Top Ten Directors". Archived from the original on 23 June 2011. ^ Grant 2007, Vol. 4, p. 238. ^ Grant 2007, Vol. 4, p. 202. ^ Freeman, Nate. "Godard Companion: Director Will Not Travel to Oscars for a 'Bit of Metal' | The New York Observer". Observer.com. Retrieved 6 February 2012. ^ "1 PM". Pennebaker Hegedus Films. Archived from the original on 24 August 2011. Retrieved 5 January 2012. ^ BFI (4 September 2006). "Jean-Luc Godard: Biography". BFI. Archived from the original on 5 June 2011. Retrieved 28 September 2011. He made an enormous impact on the future direction of cinema, influencing film-makers as diverse as Robert Altman, Martin Scorsese, Jim Jarmusch, Rainer Werner Fassbinder, Wim Wenders, Steven Soderbergh, Quentin Tarantino and Wong Kar-Wai. ^ a b Grant 2007, Vol. 3, p. 49. ^ "A Surprising Coalition Brings A New Leader To Peru". The New Yorker. 10 June 2016. Retrieved 28 July 2017. ^ a b Zahedi, Caveh. ""Be Beautiful and Shut Up": Anna Karina on Filmmaking with Jean-Luc Godard | Filmmaker Magazine". Filmmaker Magazine. Retrieved 2018-01-13. ^ Moullet, Luc (2005). "Jean-Luc Godard". In Jim Hillier. Cahiers du cinéma: 1960–1968. New Wave, New Cinema, Re-evaluating Hollywood. 2. Milton Park, Oxford, UK: Routledge. pp. 35–48. ISBN 0-415-15106-6. Retrieved 28 September 2011. ^ Morrey 2005, p. 1. ^ "The religion of director Jean-Luc Godard". Adherents.com. Retrieved 29 December 2011. ^ "Jean Monod (1765–1836), pasteur". Ordiecole.com. Retrieved 29 December 2011. ^ "Jean-Luc Godard". AllMovie. Retrieved 28 June 2014. ^ MacCabe 2005, p. 36. ^ "Jean-Luc Godard Biography: The Black Sheep". New Wave Film. Retrieved 24 May 2013. ^ "Godard Biography". Monsters and Critics. Archived from the original on 2 November 2013. Retrieved 24 May 2013. ^ "Jean-Luc Godard Biography: What is Cinema?". New Wave Film. Retrieved 24 May 2013. ^ "Jean-Luc Godard Biography: Cahiers du Cinema". New Wave Film. Retrieved 24 May 2013. ^ Richard Brody, pp. 31–34. ^ Brody, pp. 47, 50. ^ Godard on Godard, p. 150. ^ Archer, Eugene (27 Sep 1964). "France's Far Out Filmmaker". New York Times. p. X11. ^ Luc Moullet, Masters of Cinema #4, booklet p. 10. ^ Usher, Phillip John. (2009). "De sexe incertain: Masculin, Féminin de Godard". French Forum, vol. 34, no. 2, pp. 97–112. ^ Morrey, Douglas (2005). Jean-Luc Godard. ^ Michael Cieply (1 November 2010). "An Honorary Oscar Revives a Controversy". New York Times. Retrieved 27 January 2011. ^ TOM TUGEND (6 October 2010). "Is Jean-Luc Godard an anti-Semite?". The Jewish Journal. Retrieved 9 May 2012. ^ Richard Brody (2 November 2010). "Jean-Luc Godard: The Oscar Question". The Front Row. Retrieved 27 January 2011. ^ Kyle Buchanan (15 November 2010). "Jean-Luc Godard Says Honorary Oscar Meant 'Nothing' to Him". Vulture. Retrieved 9 May 2012. ^ Kino-eye: the writings of Dziga Vertov. Google Books. Retrieved 6 March 2010. ^ "Jean-Luc Godard". Electronic Arts Intermix. Archived from the original on 7 July 2012. Retrieved 11 April 2012. ^ "Anne-Marie Mieville". Internet Movie Data Base. Retrieved 11 April 2012. ^ "Six Fois Deux / Sur et Sous La Communication [TV Documentary Series]". Fandango. Archived from the original on 8 September 2013. Retrieved 11 April 2012. ^ "New Godard: "Socialisme"". Justpressplay.net. 8 May 2009. Retrieved 6 March 2010. ^ Leffler, Rebecca (15 April 2010). "Hollywood Reporter: Cannes Lineup". The Hollywood Reporter. Archived from the original on 22 April 2010. Retrieved 16 April 2010. ^ Zeitchik, Steven (3 June 2009). "Holocaust Tale Piques Auteur". The Hollywood Reporter. Archived from the original on 2 January 2010. ^ "3X3D, a 3D Stereoscopic Feature from Jean-Luc Godard, Peter Greenaway, and Edgar Pera". Stereoscopy News. 9 February 2013. Retrieved 9 February 2013. ^ "3x3D: Cannes Review". The Hollywood Reporter. 30 May 2013. Retrieved 4 July 2013. ^ craig keller. (13 September 2011). "Cinemasparagus: ADIEU AU LANGAGE / Jean-Luc Godard / 5 x 45-Minute Interview This Week". Cinemasparagus.blogspot.com. Retrieved 29 December 2011. ^ "Daily Briefing. JLG, Benning/Cassavetes, Jia + Zhao on Notebook". MUBI. 13 September 2011. Retrieved 29 December 2011. ^ Hoberman, J. (24 February 2015). "Brother From Another Planet". The Nation. Retrieved 1 March 2015. ^ "Ciak News 295: cos'è il cinema" (in Italian). Radiotelevisione svizzera. 5 September 2015. Retrieved 26 October 2016. ^ Goodfellow, Melanie (27 December 2016). "New Jean-Luc Godard, Omar Sy films on 2017 Wild Bunch slate". Screen Daily. Retrieved 1 January 2017. ^ Garcia, Patricia (10 May 2016). "Anna Karina on Loving and Working With Jean-Luc Godard". Vogue. Retrieved 9 October 2017. ^ a b Roberts, Sam (5 October 2017). "Anne Wiazemsky, Film Star, Wife of Godard and Author, Dies at 70". New York Times. Retrieved 10 October 2017. ^ a b "Jean Luc Godard's muse Anna Karina on why she refused to star in 'Breatless'". The Independent. 2016-02-12. Retrieved 2018-01-13. ^ Sagansky, Gillian. "Anna Karina on Her Torrid Love Affair with Jean-Luc Godard". W Magazine. Retrieved 2018-01-13. ^ Zeitchik, Steven (28 May 2017). "Cannes 2017: New movie about Jean-Luc Godard, from 'The Artist' director, shows auteurs can be funny too". Los Angeles Times. Retrieved 9 October 2017. ^ Horton, Perry. "Godard on Godard Biopic: 'Stupid, Stupid Idea.' But the Show Goes On". Film School Rejects. FilmSchoolRejects. Retrieved 16 April 2018. ^ Lake: Horizons Touched (2010), pp. 115–133. ^ Kern: Der Blaue Klang (2010), pp. 99–111. ^ Lake: Horizons Touched (2010), pp. 5–12. ^ Lake: Windfall Light (2010), pp. 415–441. Grant, Barry Keith, ed. (2007). Schirmer Encyclopedia of Film. Detroit: Schirmer Reference. ISBN 0-02-865791-8. MacCabe, Colin (2005). Godard: A Portrait of the Artist at Seventy. New York: Faber and Faber. ISBN 978-0-571-21105-0. Morrey, Douglas (2005). Jean-Luc Godard. New York: Manchester University Press. ISBN 978-0-7190-6759-4. Steritt, David (1998). Jean-Luc Godard: Interviews. Jackson, Mississippi: University Press of Mississippi. ISBN 9781578060818. Usher, Phillip John (2009). "De Sexe Incertain: Masculin, Féminin de Godard". French Forum, vol. 34, no. 2, pp. 97–112. Godard, Jean-Luc (2014). Introduction to a True History of Cinema and Television. Montreal: caboose. ISBN 978-0-9811914-1-6. Brody, Richard (2008). Everything Is Cinema: The Working Life of Jean-Luc Godard. ISBN 978-0-8050-6886-3. Temple, Michael. Williams, James S. Witt, Michael (eds.) 2007. For Ever Godard. London: Black Dog Publishing. Godard, Jean-Luc (2002). The Future(s) of Film: Three Interviews 2000–01. Bern; Berlin: Verlag Gachnang & Springer. ISBN 978-3-906127-62-0. Temple, Michael and Williams, James S. (eds.) (2000). The Cinema alone: Essays on the Work of Jean-Luc Godard 1985–2000. Amsterdam: Amsterdam University Press. Almeida, Jane. Dziga Vertov Group. São Paulo: witz, 2005. ISBN 85-98100-05-6. Nicole Brenez, David Faroult, Michael Temple, James E. Williams, Michael Witt (eds.) (2007). Jean-Luc Godard: Documents. Paris: Centre Georges Pompidou. Diane Stevenson, "Godard and Bazin" in the Andre Bazin special issue, Jeffrey Crouse (ed. ), Film International, Issue 30, Vol. 5, No. 6, 2007, pp. 32–40. Intxauspe, J.M. (2013). "Film Socialisme: Quo vadis Europa". hAUSnART, 3: 94–99. Lake, Steve and Griffiths, Paul, eds. (2007). Horizons Touched: the Music of ECM. Granta Books. ISBN 978-1-86207-880-2. 2007. Müller, Lars (2010). Windfall Light: The Visual Language of ECM. Lars Müller Publishers. ISBN 978-3-03778-157-9 (in English) & ISBN 978-3-03778-197-5 (in German). Rainer Kern, Hans-Jürgen Linke and Wolfgang Sandner (2010). Der Blaue Klang. Wolke Verlag. ISBN 978-3-936000-83-2 (in German). 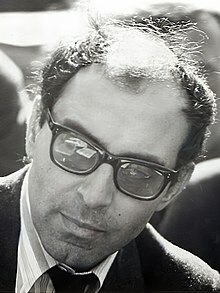 Wikimedia Commons has media related to Jean-Luc Godard. "Jean-Luc Godard collected news and commentary". The New York Times. This page was last edited on 15 April 2019, at 04:15 (UTC).